What kind of snow fence do I want? Temporary snow fences usually come in two flavors, wooden slat or polyethylene. Functionally, both are around 50 percent porosity, meaning they let half the wind and snow pass through, and half is retained and slowed. Some polyethylene fence materials can be more porous or less porous, depending on your needs. They are often colored orange for visibility, but yellow, gray, green, and black are sometimes available, too. A chief benefit is they don’t weigh as much as wooden fences, and often take up much less space for storage, but they are not durable. The purpose of a snow fence is to actually create a drift. Wood snow fences are made from slats held in place by stout woven wire along the top, middle, and bottom. They are most often painted in an attractive brick red color. Although heavier to lug, unroll, and reclaim in the spring, they can last for years. Plan on significant space for storing waist-high rolls, however. Ah, you were thinking the fence was the most important part, weren’t you? Without sturdy posts, though, you might as well unroll the fence material and leave it on the ground. The most common post is T-shaped in cross section. Be sure to pound it deep enough—at least one-third should be below ground—with the flat side facing the prevailing wind. You then affix your fencing material to the flat side so the wind blows it against the post instead of away. Use plastic cable ties, wire, or wire clips. How high a snow fence will I need? Right, we didn’t get that either. And to a certain extent, you will be buying snow fencing from a manufacturer that creates fencing in only a few different heights. Typically, snow fence comes in four-foot (48-inch) height. There’s no two ways about it. Winter is coming and we can’t stop it. That’s why it will pay to do some work now so that you’re not snowed in later. For people who live in rural areas in the frigid north, a snow fence can do wonders to keep the drive to your house or barn clear. And now is the time to act on it. Thanks to the 40-year career of Wyoming’s Dr. Ronald Tabler, the “Blizzard Wizard,” we now can install snow fences and wind breaks that work. Dr. Tabler and others have measured snow, wind, humidity, and a host of other factors to be able to predict how—and how well—snow fencing works. Bright orange has a safety advantage for snowmobilers, similar to a hunter’s blaze orange for visibility. How far away from my road should it be? 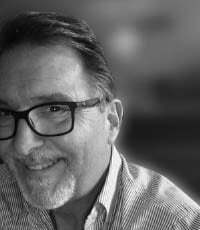 Dr. Tabler and others have performed extensive research and have developed intricate formulas to help answer that question. 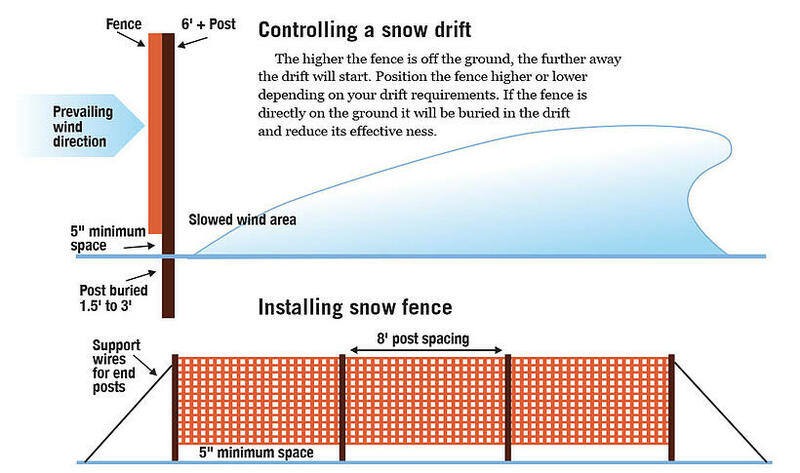 Since a snow fence is erected to create a drift where you want it (and thereby leave almost no snow where you don’t), we can use the fence height as a guide: the most snow will be trapped anywhere from 10 to 20 times away from the fence’s height. Thus, if you have purchased a six-foot high snow fence, it should be placed 210 feet from the road. Said another way, that will be the downwind location with the least accumulated, drifting snow. At the end of the day, though, the consensus is that your snow fence distance from the road (where the least amount of snow will be deposited) should be around 35 times its height for heavy snow and wind conditions. When your snow fence works as planned, it is a thing of beauty. Often, driveways or buildings protected by a correctly-installed snow fence have little-to-now snow removal needed. But do it wrong, and you have to pay the price. Do your homework and try to avoid the following errors. Installing too close to the area you hope to protect. This creates a drift right where you didn’t want it. Installing too far away is like having no snow fence at all. Having gaps in the snow fence merely creates “pockets” of snow but allows much more to blow through. Not enough coverage is what you get when you try to be economical with Mother Nature—she will find a way to create even larger drifts where the wind curls around the ends. Figure on a full 30 percent greater length than you need. Wrong location from the wind. Sometimes it happens that the usual prevailing wind can change by many degrees on the compass, but usually it is just because the installers guessed wrong or lost their bearings. Fence post depth is important, and about 1/3 of your post should be buried to give maximum support against wind loads. In areas where rock, not soil, is the rule, highway crews use deadman anchors—large blocks of cement weighing several hundred pounds—to hold them in place. A common problem is waiting too late to install your snow fence. This is not a job to be done in harsh winter winds, or after the ground has frozen. The odds are that you will give up pounding those stakes into the ground long before they are deep enough to support the fence in high winds. An additional tip: Not often explained, one crucial tip is to raise your snow fence five to six inches off the ground. This actually improves the snow fence’s performance by about 30 percent. Some archeologists theorize that England was much snowier than it is today, and residents built 20-foot high snow-fence-like structures on the plains near Stonehenge…3000 years ago. 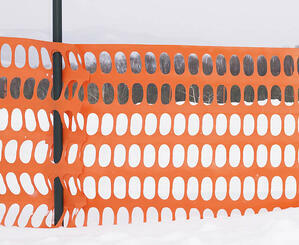 In addition to installing snow fencing, there are other options to consider, either permanent or temporary. For example, on highways that have a history of blowing and drifting snow, the Minnesota Department of Transportation annually purchases standing corn rows. Corn needs to be planted parallel to the road to serve as a fence. A typical corn row snow fence is one-quarter-mile long and 16 rows wide, covering an average of 1.2 acres. This natural fence should be set back 120 to 240 feet from the highway right-of-way. Other states participate in this, too, and the landowner can still harvest that corn in the spring (if deer haven’t consumed it, that is). More permanent is a living snow fence. Properly designed and placed, living barriers of trees, shrubs and bushes can slow and trap snow before it drifts into roadways or farmsteads. ‘’The value of an acreage is determined, largely, by the quality of its windbreak,” according to an old farm real estate adage. Living wind breaks made from an organized planting of trees, bushes, shrubs, and grasses not only provide valuable habitat for animals, but prevent drifting snow. A common approach where trees aren’t desired is to plant a twin shrub row. In the upper midwest, this often involves red-twig dogwood—which is very pretty against white snow—and some other species, such as common ninebark. For a living windbreak-slash-snow fence installation, contact your state extension service for the best planting options.